Today was one of those days where there was no good news to be found. The world is in bad shape on so many levels in so many places. Luckily, I got to spend a rare day alone with my older son, Eli, who will be six in a few weeks. Better yet, he wanted to sew. Last summer, we made a pillow together. It was a big hit, and something we had on our to-do list for August. 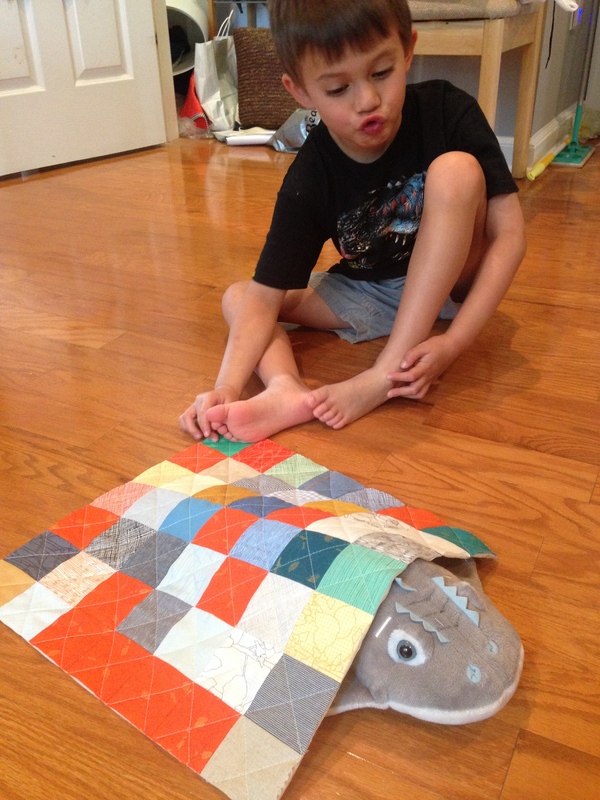 In June, the little marine biologist/paleontologist decided that his stuffed shark ray needed a quilt. He very expertly chose my Carolyn Friedlander mini charms and requested that I cut a few extra orange squares from my yardage. What can I say, the boy has good taste. He picked the layout himself. He made it about halfway through piecing before getting bored, which was completely understandable for a near-Kindergartener. But after a little TV time during which I sped along, he was very pleased to see the size (it needed to cover shark ray’s tail but NOT his eyes), even though it wasn’t a rectangle. He thinks all quilts should be rectangles. He also thinks that the quilting would look best with straight lines AND zig zags, so we compromised and did diagonal cross hatch. The binding is a gray Dear Stella dot. It was the perfect little project for a day like today. Between this, Candy Land, and a little too much chocolate milk, we made today a day of simple but meaningful pleasures. I wish you the same. Adorable! Eli has great taste and an expert eye like his mamma. Glad you were able to enjoy the day together. This is just so wonderful. I love it. I love that he chose the fabric, the layout, asked for extra of one color, had specific ideas on size, shape and quilting. But mostly that you shared your fabric, time and talents with him, and didn’t over-control every part. I hope he treasures it for a very long time! I am just so glad you got a simple beautiful day with your son. 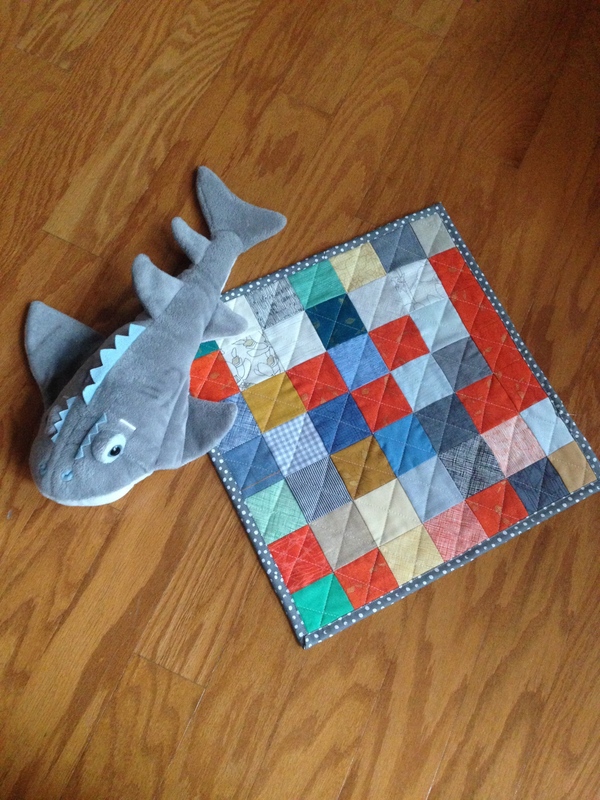 You son has fantastic taste, and the quilt looks very snuggly for the shark ray. So glad you guys had a nice, cozy day together to help keep the crazy world at bay with love and care. 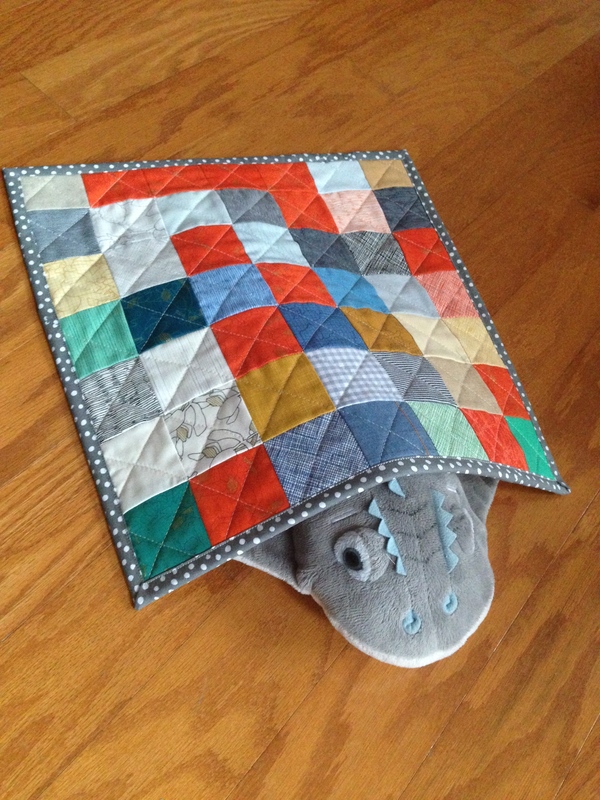 What a wonderful story of this little quilt making project, especially sine Eli seems to have the makings of a designer already, as he knows what he wants and doesn’t want. Happy day. So sweet. Sounds like a perfect day! property that suits your every need. Promote other businesses online through affiliates.